For seafood products derived from aquaculture, the OSO® brand is a guarantee that the farming conditions are officially certified according to French Organic ("Agriculture Biologique") rules. The same applies for OSO®'s wild species, which are caught in accordance with our "responsible fishing" standards. In this spirit, OSO® offers a range of fish and shellfish, including Organic and Wild Shrimp from Madagascar, Organic Sea Bass and Sea Bream from the Gulf of Corinth and Organic Mussels from Pénestin. 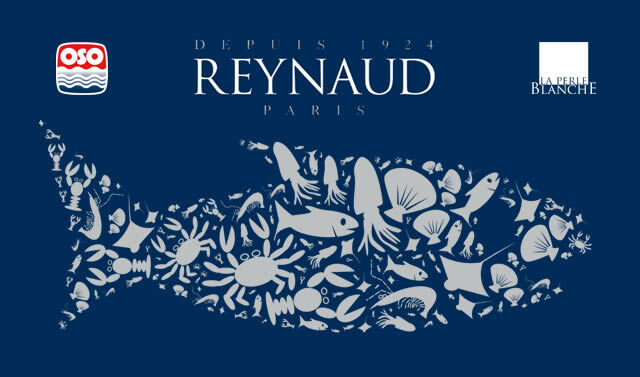 For over 90 years, Reynaud®, the brand of high-quality seafood gastronomy, has endeavoured to offer a wide range of products of excellence. Its gastronomic selection provides the ultimate guarantee of full respect for flavours, textures and gustatory enjoyment to offer gourmets an unforgettable taste experience. This selection includes Salmon from the Arctic Circle as well as Sea Bass and Sea Bream from the Gulf of Corinth. La Perle Blanche® oysters are given three years of attention and care before they reach their full maturity and offer their greatest level of excellence. They are farmed between Normandy and Charente-Maritime, passing through the Charente sluices, where they are born, to Utah Beach, where they grow, before returning to the Marennes Basin, where they finish maturing. When they reach maturity, they are fished, sorted, cleaned, carefully prepared, packaged into trays and sent each night to the Reynaud® pavilion. La Perle Blanche® oysters are offered to fishmongers and restaurant owners who are uncompromising on taste and quality.